The Center for Tomorrow bus stop, close to restaurants such as Zetti’s near North Campus, is just one of the many locations students can get to in order to enhance their UB experience. I’ve spent roughly one-fifth of my life at UB. 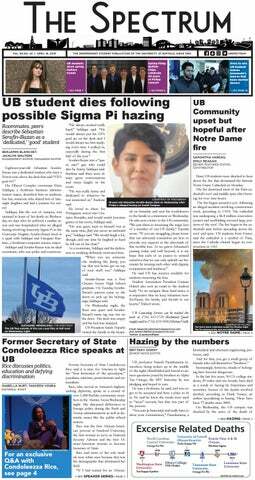 As a current graduate student, and a UB ‘18 alum, I’ve probably copped more free T-shirts and ate more Sizzles home fries than any of The Spectrum’s current readers. I know all about UB’s secret locations, too, and exposed them in Sept. to destroy anything left of my integrity. This is also my third year with The Spectrum, so it’s natural that WKBW and WGRZ keep syndicating my influential story ideas every week (if you guys want a fresh face on your staff, my email is below). So in order to spice up my game, I compiled a list of helpful things I’ve learned at UB, which you can disregard if you think you’re somehow too good for peer-to-peer advice. When your only exposure to Buffalo is through a Buffalo wing at Hubie’s (although they do sometimes give you an extra wing), it’s no wonder how your view on the Queen City can get twisted. If you have a friend with a car, or can master the NFTA bus routes, explore your new hometown. Throw your body into a folding table outside New Era Field, or yell at the Mighty Taco drive-thru box when they run out of Loganberry at 10 p.m.
Whatever you have to do, do it. Buffalo’s entertainment shouldn’t hinge on Victor E. Bull hitting them folks at a football game, should you seek to receive the best of the area. I’m not a medical student. In fact, my only understanding of drugs is the appropriate Advil dosage for a 22-year-old male. With all that said, I still find a seat on UB’s Blue Line shuttle bus from South Campus to the downtown medical campus. Why, you ask? Because I’m a cheapskate who doesn’t want to pay $4 for an NFTA round trip from University Station to Allentown. UB transportation is a gift and a curse. It’s a passport to the Center for Tomorrow stop, the closest UB bus stop to off-campus cheesy meals such as Zetti’s. If you accidentally sleep on the Stampede, too, you may also get a free ride to an overnight stay at First Transit’s Getzville bus station. Whatever your passion, it’s probably a hop, skip and a bus ride away. When I came to UB in 2014, I likely signed up for three dozen club emails at orientation. Sure the sewing club would’ve been a cool resume builder, but did I want the maximal UB experience? Not at all. Instead of doing the most, I stuck to a select group of clubs and organization meetings. My first two years, I was part of the School of Management’s marketing club, and I followed this experience with The Spectrum and WRUB. The best way to do this is to be involved in two things max outside of class. Enjoy your free time and spend it wisely. Several editors at The Spectrum mock my daily debt to Tim Horton’s or Starbucks come lunchtime. This semester, however, I’ve changed my course from the big coffee chains. UB’s coffee is just as good as Tim Horton’s, and I’ll go out on a limb that’s ready to collapse under my weight to prove it. From the sweet staff members and brews at Capen Cafe, to the convenience associated with coffee at the Baldy Walkway, the cheaper the coffee the better. In 2014, former UB Vice President Dennis Black told my orientation group that going to UB is the best bang for your buck. Black’s words, forever ingrained in my mind, also seem to help me in my daily grind for black coffee. If you’re from Long Island, I don’t care. Sure, your coffee and bagels are amazing, but open your mind a little to the best of Buffalo. Like UB’s lovely Long Islanders, I, too, am a regionalist at heart. I’m from the Albany area, I say food is “smack” when it’s good and I think no other corner store can beat Stewart’s Shops. But I repress my braggadocio about back home while I’m here. It’s important to maintain civility regarding your snobbishness. Instead of waiting to go back home to get an everything bagel, try some Bagel Jay’s. And Buffalo is no pizza central, but a little Bocce Club Pizza wouldn’t hurt you. Sure, you don’t want to lose track of yourself while you come to UB but feel free to open up your brain, and your wallet, to new opportunities.